The Subway diet plan is different than most fad diets as it is a healthier plan than most and it centers around fast food purchased through the Subway sandwich chain. This diet was inspired by marketing that claimed Subway sandwiches offered a healthy alternative to greasy burgers sold by the competition. One obese young man took these claims to heart, lost weight and Subway found the human connection that made this diet appeal to both men and women. The obese Subway customer's name was Jarod Fogle. At the time he started dieting by eating Subway, he wore pants with a 60-inch waistline and tipped the scales at 425 pounds. He had unsuccessfully tried to lose weight with a number of popular weight-loss programs, but this time, he took a unique approach that centered around eating subs from Subway for lunch and dinner. It worked for him, and he dropped 245 pounds and launched a career as the brand's spokesperson. Lunch: Six-inch turkey sub with a small bag of Baked Lay's chips and a Diet Coke. Dinner: Foot-long veggie sub and a Diet Coke. His sandwiches included plenty of fresh vegetables like lettuce, green peppers, pickles, and banana peppers but he didn't eat cheese or mayonnaise. Instead he used a dab of mustard for flavor. He ate no snacks, and as the weight started to drop off, he felt more energetic and started walking to classes. By the end of his weight loss journey, he clocked in about one-and-a-half miles every day. Snacks: One piece of fruit is allowed between meals. *No cheese, mayonnaise or other sauces are allowed on subs eaten. Exercise like walking is recommended and drinking plenty of water is also part of the Subway Diet plan. Jared Fogle had tried most of the popular weight loss plans before losing weight by eating at Subway. Why did this diet work when others didn't? A couple of possible reasons are that the diet made low-calorie food choices easy. He knew what he would eat for lunch and dinner, and all he had to do is order them and eat them. 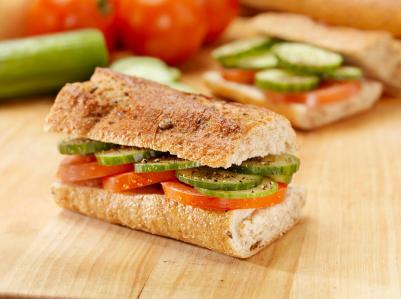 While the Subway diet can help you lose weight, it can also take a bite out of your pocketbook, if you eat out for two meals a day everyday. One way around this is to buy the ingredients and make the sandwiches from scratch at home. Another possible downfall is getting bored with the same foods day after day. While this diet does help people to eat less, it doesn't really teach them how to transition to eating less for the rest of their life unless they plan to eat subs for lunch and dinner into their old age. This is a calorie restricted diet which provides about 1,000 calories a day which is not enough more many people. The bottom line is that the Subway Diet is a low calorie approach to weight loss. Before you decide to follow this or any diet, it is important to talk with your healthcare provider to see if it is the right weight loss approach for you. If you do decide to follow the Subway Diet, you can find nutritional information including calories on their website. Subway is also testing gluten-free bread options in limited locations in Texas, so in the future there may be a gluten-free Subway diet option as well.